I was driving in the country yesterday for pleasure, looking to see what I might see. My eyes spied in a field afar a group of deer. I got my binoculars to get a closer look. A buck was standing there, looking good with his masculine rack. I kept looking -- putting the binoculars to very good use. And then my eyes were drawn to some litter. A litterbug had apparently discarded some trash by the road, then with the wind it had blown into the field. After the deer were departed, I climbed the fence and ventured across the field, which turned out to be quite a walk -- these were really good binoculars. It reminded me of the first time I saw the Rocky Mountains; you see them from an enormous distance, then you drive toward them but you never actually arrive. In this case, though, I reached the spot where the litter was -- which turned out to be exactly what I thought it was from a distance (with my really good binoculars ... I could've guided an unskilled hand in heart surgery from my car with just the binoculars and my phone.) The litter turned out to be an ice bag. 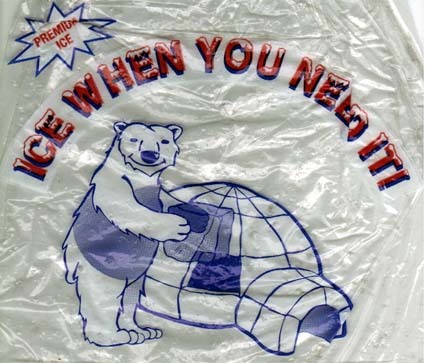 The very kind of bag you get ice in from an ice machine. I'm of course now interested in ice machines, trying to work myself up to a fanaticism and expertise on the subject so that someday I might be featured on the Travel channel. So I'm interested naturally in ice bags too. And what demonstrates my fanaticism any more than walking across a huge field to claim an ice bag stuck up against some weeds, being buffeted in the wind? There was some risk in this undertaking because the field was marked 'No Trespassing,' and the farmer might've caught me -- technically the litter belonged to him. But I made it back to the road OK, so that's a little bit of extraneous karma I'll get to deal with sometime later, doubtless. Anyway -- as to the bag -- what an interesting specimen it turned out to be! You can see it in the picture, admittedly not as good as being able to see it up close, where you'd be able to thoroughly examine it. What I notice first is the great illustration, meant, I assume, to convey the sense of coldness. It's a polar bear standing on his back twos and holding a block of ice in his front twos. He's in a very cold land, as is typical for polar bears. There's an igloo in the scene. By the looks of it, the igloo either has a window or its simply missing a block. Perhaps the bear is going to stick the block there (the nice option), or maybe he took the block from there (not so nice) to sell it. The smile on his face doesn't show anything incriminating, in my opinion, so we'll give him the benefit of the doubt. The part I like best is actually one of the smaller elements, in the upper left corner, a small starburst mortice with the words "PREMIUM ICE." That's good. You're not just getting ordinary frozen water; it's better than that -- it's premium. It might be cubed, crushed, or extra crushed; whatever, it's the good stuff. This was a great find. And the walk didn't bother me -- I need the exercise. I also got to see some cool deer, including a buck. I only regret that I had to trespass on a guy's field. But look, I was able to liberate an excellent ice bag! UPDATE: I'm going to leave out the name of the ice company that made this ice and their location. The last thing I want is more competition in this ice fanaticism thing I've got going. And, besides, the ice companies already have all the ice machine groupies they can handle.